Right now, if someone attacked you, could you get to your weapon? Carrying a gun or pepper spray isn’t a bad idea, but it can create a false sense of security. Most violent attacks happen suddenly, so time is a luxury you might not have. Your attacker isn’t going to wait while you dig around in your purse or vehicle. Often you would have to take your eyes off of or turn your back to an attacker to retrieve your weapon. The valuable seconds you waste could mean the difference between life and death. Regular Krav Maga training makes you a weapon. Learn how to react instinctively to overwhelm your attacker and keep you and your family safe. Here are some of the situations you’ll learn to defend against. Inside defense – When your attacker comes straight at you and sends a blow toward your face or upper body, inside defense teaches you how to deflect the punch. Outside defense – If the attack comes from above, to the side or down low, Krav Maga teaches 360 degree defense. Choke defenses – If someone tries to strangle you from the front, back, side, or against a wall, even if they’re pushing you, Krav Maga teaches a quick escape and counter-attack. Bearhug defense – if your attacker restrains you from any angle, whether your arms are caught or free, even if a much larger attacker lifts you off the ground, Krav Maga trains you how to get away. Wrist releases and arm pulls – If someone grabs you by the wrist or the arm and tries to drag you places you don’t want to go, Krav Maga teaches you how to escape their grip and follow up with an attack that makes them wish they hadn’t tried. Gun, knife, and stick defense — For many people, their worst nightmare involves an attack with a gun, knife or blunt object. 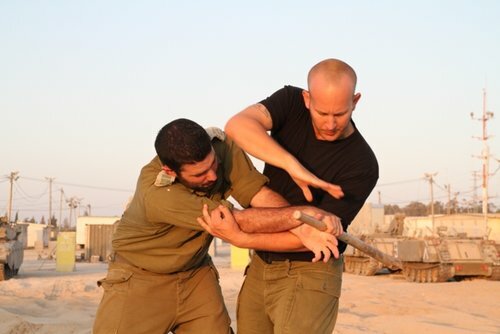 Krav Maga trains students to redirect the weapon, control the weapon, attack violently, and take it away in seconds. Ground fighting — Krav Maga never trains you to stay on the ground, but sometimes you don’t have a choice. Krav Maga teaches moving, kicking and grappling so you can get up as quickly as possible. Would you know what to do if you were faced with the attacks listed above? Regular training at East Texas Krav Maga will make you lethal, so you never have to be afraid. Sign up for your free trial today. Do you want to try Krav Maga, but find you keep putting it off because you’re nervous? In the back of your mind you picture a place where everyone is either a super ninja or an MMA fighter. What if it’s totally awkward and you don’t know what to do? What if it’s physically too difficult? You fear everything from wearing the wrong clothes to getting hit by someone who looks like The Rock. 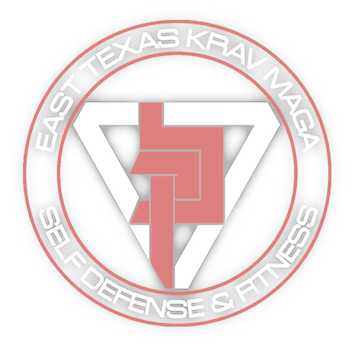 Here’s what actually happens in a typical self-defense class at East Texas Krav Maga. A staff member will be at the desk to get you signed in. You’ll fill out paperwork similar to what you see any time you visit a new gym. Then we’ll show you where you can put your things and help you find a partner for the class. Class starts with a 10-15 minute warm-up to get your heart pumping. Every class is different, so your warm-up might include pushups, sit-ups, lunges or other basic bodyweight exercises. Once your body is warm your instructor will lead you through active stretching. It takes intense training to be a Krav Maga instructor, and we’re pretty proud of ours. They excel at providing Krav Maga students the most powerful and effective learning experience possible. • The instructor demonstrates the technique with another instructor or higher level student. • Instructors walk the whole group through the technique, breaking it down into a series of steps and practicing each step one at a time. • The group gradually speeds things up, practicing movements on their own in front of a mirror. • Individuals work in partner groups to practice with live partners. After you get comfortable with basic combatives we’ll devote the rest of the class to self-defense techniques. We’ll let you practice with a partner, then drill to train speed and accuracy. The class culminates in a stress drill to solidify your knowledge in a tense situation. Krav Maga is training for real life violence. From the very first class you’ll be sending real punches, kicks, knees and elbows. You’ll practice live on pads, heavy bags and other equipment. Guys usually wear gym shorts and a T-shirt. Ladies wear shorts or leggings and a tank top or T-shirt. Wear athletic shoes and if you have long hair, you’ll want something to pull it back. When you leave you’ll feel exhilarated. From your very first class you’ll do things you didn’t think you could. You’ll walk out with new confidence and new friends. Don’t put it off any longer. Click here for more information or call (903)590-0085.